A Cardboard Problem: Get your favorite ... torturers? Just when you thought you have seen it all, apparently the best way to get a point across is with trading cards. 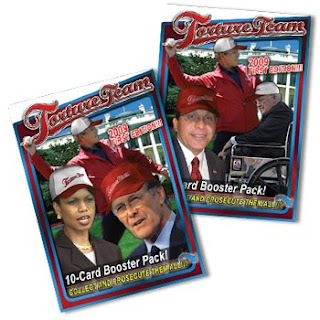 The Center for Constitutional Rights created trading cards for the Torture Team highlighted by George W. Bush. The site is worth going to just for the sound alone. There are different categories of torturers from The Executives (those in the White House) to Spies and Free Agents. The CCR created a flash site and clearly spent a lot of time on it. You can order the set of twenty cards (for free, apparently), examine evidence and, even, create your own cards. The idea of the trading cards is to get all those involved out of the open and not just the principal members. This isn't a forum for politics. So, I won't get into the viewpoints of how I feel about the former or current administration. The post was just to highlight a new product of trading cards - torture. Topps should maybe get on this and put these as inserts into their product next year. It's better than a Ferris Wheel, I guess. So, yeah, I ordered my free 10-card booster pack. Shipping is free for the 10-pack of cards. They should arrive in 3-7 weeks. Labels: Torture, trading cards, WTF? I just ordered myself the 10 card pack. Free is Free. ...I'm not exactly sure how I feel, or rather I can't express it in words, or at least ones that would make sense. I ordered up some just for the entertainment value. I wonder if they come with any weaponized bubble gum? I will probably use them in my bicycle spokes. This might have had some relevance about two or three years ago. I am appalled. I am an Iraq War vet and all I can say is I am honestly offended. I lost friend in the 9/11 attack and all I can say is because of those "torturers" I didn't lose anymore friends or family members. Anonymous had it right...fair is fair. I don't really understand the point of these cards either. The pictures are comical, but they are a little anti-American in a sense. Chris, we should all be thankful to all veterans and to all military currently serving the country because without them who knows what else could have happened after 9/11. I agree that the cards are in poor taste, and I won't be ordering any, but in response to some of the comments here - do you really think that torturing people has made the U.S. safer? From what I've read, the interrogators are more likely to get bad information by torturing because the prisoner will say whatever they think the torturer wants to hear in order to make it stop. And besides being ineffective, torture is definitely immoral. When you see the horrible pictures from Abu Ghraib, I can't imagine that it makes anyone proud to be an American. In my opinion, the torture that has taken place since 2001 under both the Bush AND Obama administrations has been due to a rushed overreaction about how to best fight terrorism, and it'll go down in history as one of the most embarrassing actions in American history.